In the Netherlands, Nouryon (formerly AkzoNobel Specialty Chemicals) has officially launched the third edition of its Imagine Chemistry collaborative innovation challenge. Through this program, the company invites startups, scale-ups, university spin-outs, and other potential partners to tackle chemistry-related challenges and uncover new ways to create value for customers. To increase the focus on developing business opportunities from this year’s edition, Nouryon has expanded the number of Imagine Chemistry partners to include Unilever; seed investor High-Tech Gründerfonds; and the Green Chemistry & Commerce Council (GC3), a collaboration that drives the commercial adoption of green chemistry. Also, it’s supported by venture capital firm Icos Capital; research and advisory firm Lux Research; UK innovation agency Knowledge Transfer Network; Dutch accelerator StartupDelta; the European Commission’s Enterprise Europe Network, and S/park, the chemical technology-focused open innovation center located at Nouryon’s RD&I site in Deventer. A new and powerful wave in R&D these days is grouped under the term “open innovation”, which needs a little explanation. The idea of a distributed community of researchers around the world working collaboratively towards market-facing goals has been easier to articulate than to achieve. Here’s the problem: smaller companies can be highly effective in developing technologies that big organizations need — but they don’t always know exactly what to focus on. Big companies have the focus, but don’t always have the resources to do everything, and there are the well known big-company bottlenecks to contend with, as well. In the venture world we’ve seen some forward-thinking firms forming advanced development partnerships with small R&D firms and with academics, aiming to leverage the substantial flows of government funded research and steer them in the general direction of technologies that fit the venture model. The hope is to bring technologies in a more advanced development stage to the venture model or possibly to limit the number of technologies that need funding for, for example, proof of concept — thereby directing venture funds more towards the later development stages, and possibly reducing venture timelines to meet the daunting VC return on investment hurdle rates. 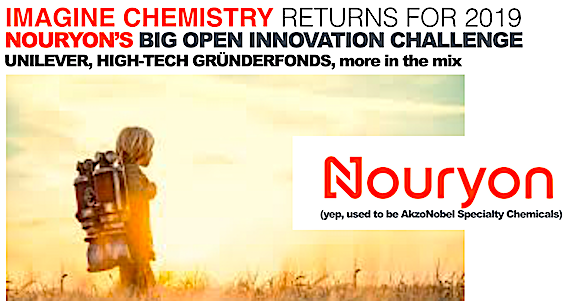 Nouryon — until a few weeks ago, known as Akzo Nobel Specialty Chemicals — has been the most visible and successful practitioner of open innovation in the chemicals business, because of the Imagine Chemistry program. Directly, it’s bringing Nouryon closer to smaller organizations that have technologies of interest. Indirectly, it’s raised Nouryon’s profile around the world as a forward-thinker. We noted that the European Commission’s Startup Europe Partnership (SEP) initiative nominated the most active corporate firms in open innovation and in 2018’ lauded 36 companies – Nouryon was the only chemical firm in the ranking. Let’s look at the four named targets for this year’s Challenge. Last year, 150 innovative ideas arrived from startups, scale-ups, scientists and others. Four overall winners received joint development awards with AkzoNobel Specialty Chemicals to help bring their ideas to market. FiliGrade, one of the winners of last year’s challenge, recently started supplying watermark technology to AkzoNobel Specialty Chemicals. The technology provides an invisible watermark for packaging that identifies both the material used and details about the manufacturer and contents. This helps with the challenge of sorting of plastics and therefore enhances the recycling of packaging, and also to confirm the authenticity of the packaged product to prevent counterfeiting. Another US firm, Fero Labs – represented by Berk Birand and, Alp Kucukelbir, were awarded for their machine learning software, which can be used to predict quality issues and production bottlenecks and improve key process parameters. Nouryon (formerly AkzoNobel Specialty Chemicals) will expand its offering to customers in the detergents market through a supply agreement with bio-based polymers maker Itaconix. Under terms of the agreement, Itaconix will produce and supply polymers with chelating properties that Nouryon will market to customers in household, institutional, and industrial detergent and cleaner applications. In addition, the companies will work together to transition many of Itaconix’s current detergent customers to Nouryon. Nouryon has been on the move. A consortium of companies comprising Air Liquide, AkzoNobel Specialty Chemicals, Enerkem and the Port of Rotterdam has signed a project development agreement covering initial investments in an advanced waste-to-chemistry facility in Rotterdam. The facility will be the first of its kind in Europe to provide a sustainable alternative solution for non-recyclable wastes, converting waste plastics and other mixed wastes into new raw materials. The initial investments, which cover detailed engineering, the setup up of a dedicated joint venture and completing the permitting process, will be worth €9 million. The consortium aims to take the final investment decision (FID) for the estimated €200-million project later in 2018 and has appointed Dutch Rabobank as the lead advisor for the financing process. Realization of the project is supported by the Dutch Ministry of Economic Affairs & Climate policy, which have agreed to develop mechanisms and regulation that will help bring this new technology to full scale to support the low-carbon transition of the Dutch economy. The waste-to-chemistry project is also supported by the City of Rotterdam, the Province of Zuid-Holland and InnovationQuarter, the regional development agency. The facility will convert up to 360,000 tons of waste into 220,000 tons (270 million litres) of ‘green’ methanol. As an equivalent, this represents the total annual waste of more than 700,000 households and represents a CO2 emission savings of about 300,000 tonnes. The facility will be built within the Botlek area of the Port of Rotterdam using Enerkem’s proprietary technology, and will convert non-recyclable mixed waste, including plastics, into syngas and then into clean methanol for use in the chemical industry and for the transportation sector. Today, methanol is generally produced from natural gas or coal. The plant will have two production lines, or twice the input capacity of Enerkem’s commercial-scale plant in Edmonton, Canada. It will benefit from the state-of-the-art infrastructure available within the Port of Rotterdam, as well as synergies with Air Liquide (large industries) for supplying the required oxygen and together with AkzoNobel, the raw material hydrogen. AkzoNobel also acts as a customer for the methanol.